I'm a big fan of cookies. Especially those of the GIANT variety. 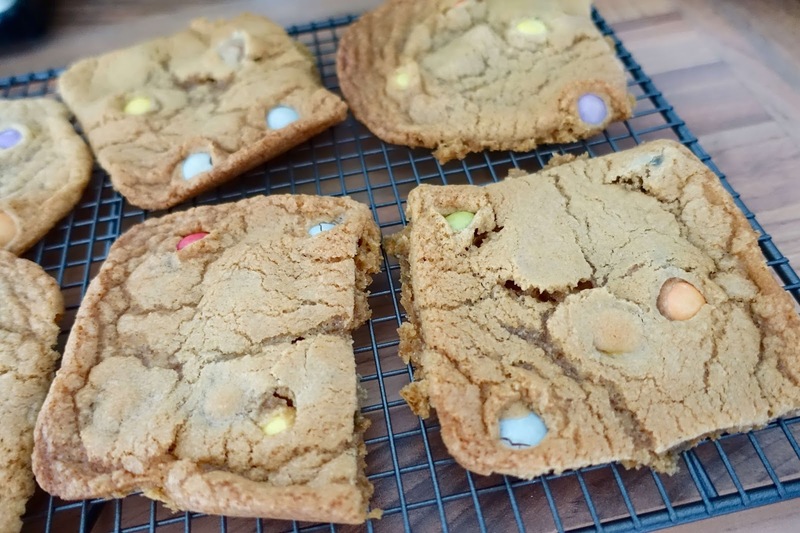 This morning I decided to make another popular cookie variation which I know you guys will likely love; lots of giant smarties cookies! 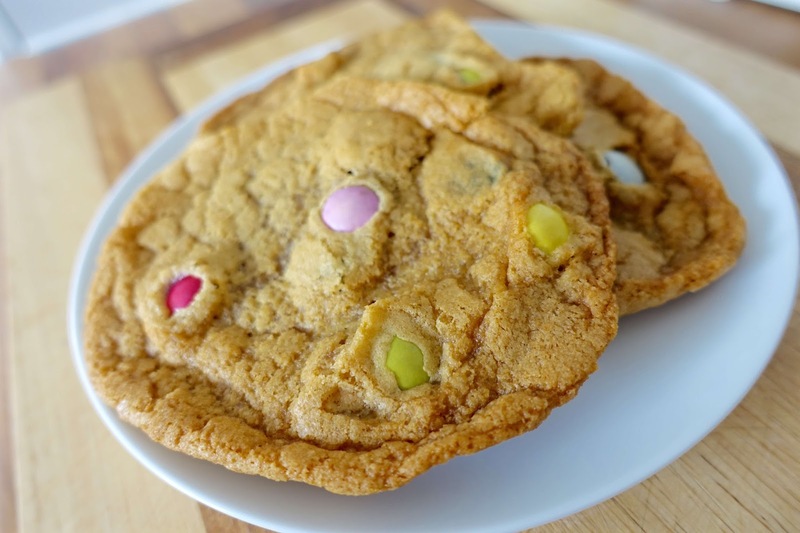 I've been keen to make smartie cookies for a while, unfortunately I couldn't get my hands on any 'giant smarties' in the shops, however I'm questioning whether Nestle even sell these still? so I had to settle for the normal sized smarties. 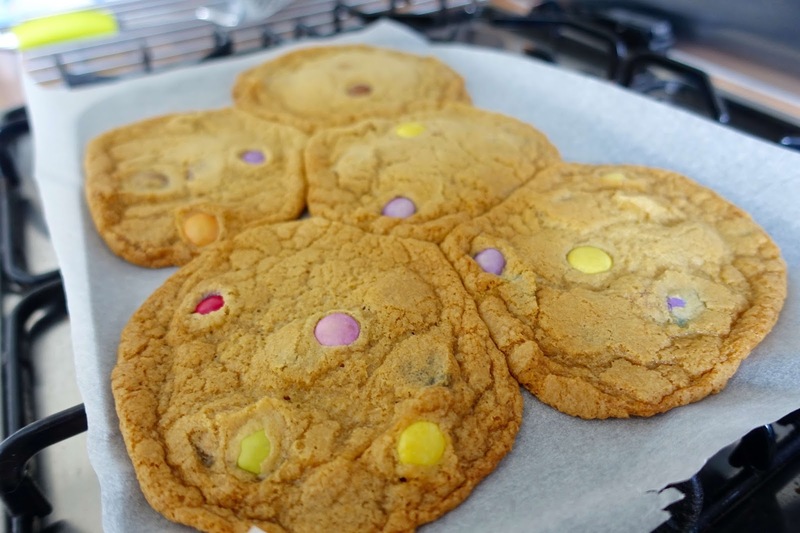 However, I've made up for that by going large on the cookie base, so you're guaranteed to get a lot more smartie per centimetre. The main reason I made these cookies is because I was asked to help out a local tea room on their opening day (today) and as my mum is going to be working in the tea-rooms part time, knowing I like to do a bit of baking here and there, she asked if I could help out and bake something sweet for the locals to try during the day. 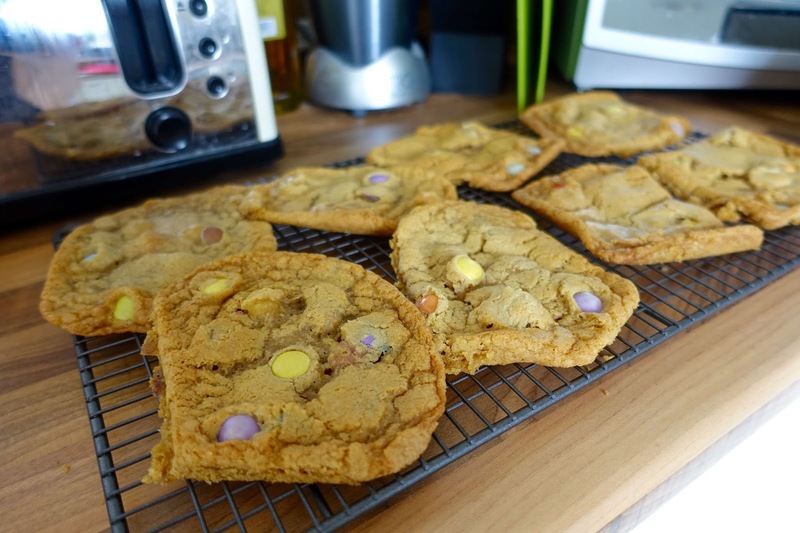 With short notice and not much time, cookies were definitely my fail safe option, plus who doesn't look a MASSIVE cookie with their tea or coffee? Exactly. 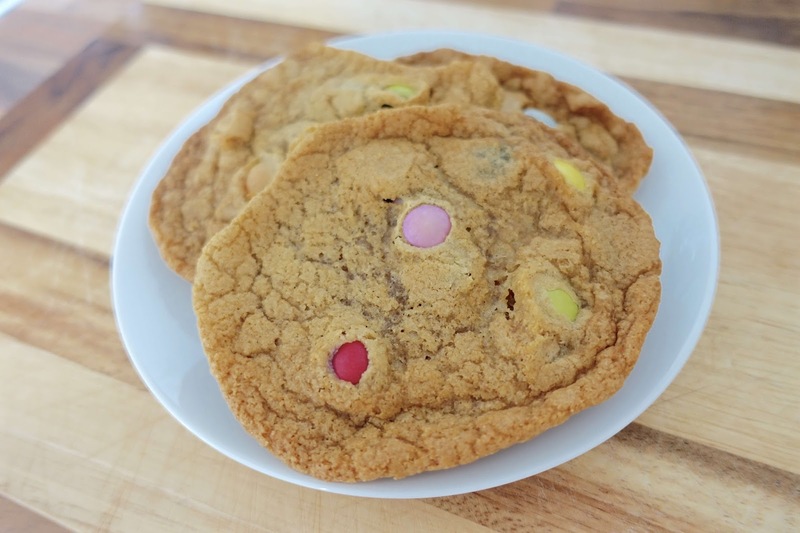 If you need any more persuading - all of these smarties cookies were gone and gobbled by customers in the first thirty minutes, so why not bake a batch yourself? Preheat the oven to 170 degrees / 325F / Gas mark 3 and line two baking trays with greaseproof paper. Grab a mixing bowl and using either a hand-held or electric whisk, or just with a spatula, cream together the butter, both the white and brown sugar, then break in the egg, add the vanilla essence and mix well together. In another bowl sift together the plain flour, salt, cinnamon and bicarbonate of soda and then add to the already creamed mixture. This is usually best done in two batches. Ensure to mix thoroughly until a dough starts to form. This is where you will need to add your cooking filling - the smarties! Mix in 3 out of the 5 tubes of smarties and mix evenly into the dough. Now break off pieces of the dough (about 3 or 3 tablespoons in size, depending on how big or small you want your cookies to be - for these I did about a golf ball in size). Roll them into balls in your hands - bearing in mind this part can be a little messy! Once rolled into balls place them onto your baking tray. I decided to use my 4th tube of smarties for pressing a couple into each ball so there was smarties both inside and outside of the cookies. Allow about 5 cookies per tray (especially for these big ones) and make sure to space them apart from each other so they have room to grow. Believe me they grow big! Place in the oven and bake for about 10-12 minutes, or until the cookies are a light golden on top. 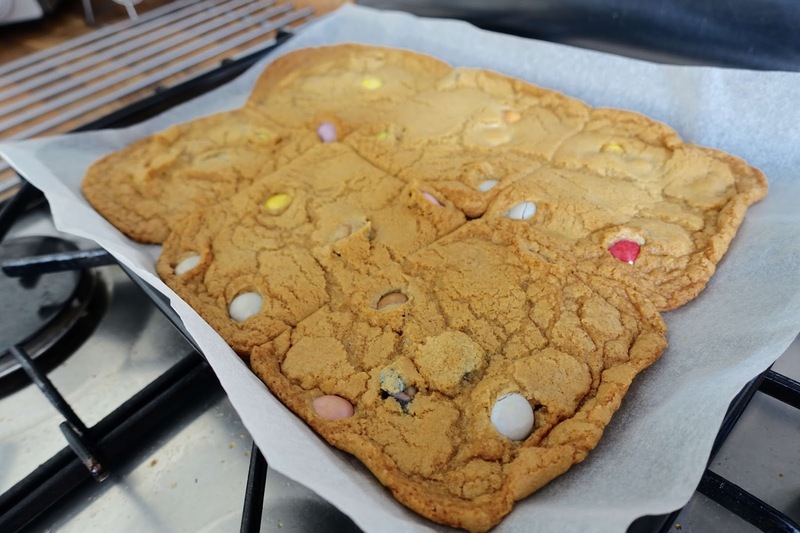 The key with baking your cookies is if you want a gooey middle you'll need to take the cookies out of the oven while they still feel soft and squidgy. Don't worry - once you leave them to cool they will firm up quite quickly and you definitely won't regret taking them out a minute or two early. Once out of the oven, leave on the baking tray to cool and firm for about 10 minutes, before transferring over to a wire rack. Check out my other cookie recipe (very similar to this one) where I included white chocolate and cranberries for the giant cookie filling. Also I've now got Snapchat so don't forget to follow me on there for live updates.